Two weeks ago I was asked what role Rahm Emanuel is meant to play in the Obama Administration's campaign against Israel. That question has now been answered. Emanuel has been selected for the unlikely role of the "Good Cop" in an administration full of "Bad Cops". 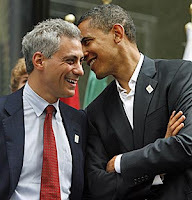 After seemingly steering clear of Israeli policy, Rahm Emanuel surfaced in a meeting with several moderate liberal "Rabbis" to explain that the Obama Administration was actually extremely pro-Israel, only their "messaging" was screwed up. The "messaging" tactic is one that the Obama Administration has repeatedly used to reassert its position while arguing that critics simply didn't understand what was being said to them. Think of Cool Hand Luke. "What we've got here is a failure to communicate." What that really means is a failure to obey. Run that through PRese and mix it up with a handful of buzzwords, and it's another attempt at pushing the "Reset button" while really saying, "We're not wrong, you're stupid." Hoping that the people they're talking to are too stupid to realize what's really being said and done to them. The idea that Rahm Emanuel is the Obama Administration's top Jewish asset is already surreal. Despite his background, in his actual job Emanuel has shown about as much interest in Jews and Israel, as Biden has shown in the Irish and Ireland. But Emanuel's own political ambitions doubtlessly played a major part in allowing him to select this role for himself. The real Rahm Emanuel has no loyalties except to himself, which is why he isn't about to let himself be used as a "Bad Cop" and then thrown under the bus. It's safer to be the "Good Cop" and then walk away claiming you were misled by people you trusted, once the wheel turns. But Rahm's soiree shows a dose of worry by the Obama Administration when it comes to their Jewish support. The full list of Rabbis he met with hasn't been released, but those who have are younger, moderate liberal and pro-Israel. This marks a retreat from the unofficially official position of the Obama Administration that its hostility to Israel is actually representative of a "new generation" of Jews who hate Israel. And anyone who disagrees is just a "Likudnik". Of course they don't say "hate". They have nicer terms than that, which is helpful when what you're really talking about is collaborating in genocide. All along J Street and left wing anti-Israel groups have been promoting a youthful self-image, which is a tough sell considering that its president, Jeremy Ben Ami is pushing 50, and its moneyman, creaky Nazi collaborator George Soros, is pushing 80. But the left's progressivism requires casting their struggle as that of the caring and passionate youth against the uncaring old men. Even if the old men are the ones who are actually running the show from behind the scenes. Especially then. And so after picking over the rhetorical bones of Peace Now, they emerged with "Dor Shalem Doresh Shalom" or "A Whole Generation Demands Peace". If you believe the Obama Administration, the Beinarts and the J Streets, they already control the youth, and only the aging organization leaders stand in their way, only because they haven't caught up with reality yet. This is classic leftist cant, that confuses their own propaganda with reality. 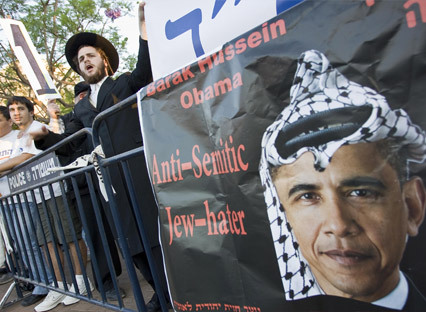 And Obama's falling poll numbers have forced him to backtrack from the lie that his position on Israel is that of a majority of Jews in America. And after a year of extremely slimy tactics that ranged from accusing Jewish pro-Israel leaders of being out of touch with their own communities to using media proxies to hurl accusations of Dual Loyalty at anyone critical of the Obama Administration's mangling of Israel-- Rahm appears to throw a few crumbs to the people who need it most. Liberal Pro-Israel Jews who are genuinely worried about the crisis in relations between the two countries. The meeting marks no retreat, only a bone thrown to a starving dog. Many liberal Jews who do care about Israel and nevertheless voted for Obama need a reason not to turn on their master. And if a pat on the head was all it took to make Elie Wiesel lick the administration's hand, the idea is all it will take is a few sit downs with Rabbis from Florida to keep the Jewish vote from spinning too far out of control. A few doses of the old campaign spin. A little less James L Jones cracking jokes about greedy Jews, and a little more Dennis Ross, Baker's ole Jewboy, on set to calm frayed nerves and assure everyone that Obama is doing everything it can to protect Israel. 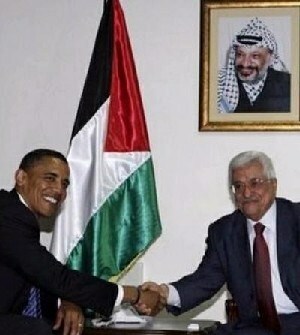 When of course Israel would much rather that Obama go "protect" someone else out of existence. If you listen to Rahm Emanuel, David Axelrod and Dennis Ross then there's nothing wrong here. Just another "failure to communicate." The reality however is that it's not the messaging, it's the message. Politicians and PR spinners love to blame the messaging, because it lets them go on thinking that they can sell any lie, so long as it's gift wrapped in a pretty enough package. But it's not the messaging, it's the message. And the message is that Israel is the problem and that Palestine is the solution. That Israel's refusal to surrender 100 percent to terrorists is what is killing American troops. That Jews have no right to live in Jerusalem. That Israeli concessions are a prerequisite for any form of negotiations with terrorists. That the Obama Administration will wink at terrorism against Jews, but shriek furiously at a Jewish house in Jerusalem. All this is not messaging. It is the message. And the message is the same one delivered by Obama in Cairo. A copy of which he gave Netanyahu as a "gift". A newly Muslim friendly America that will use its leverage to finally bring Israel to its knees and destroy it, and by doing so build a new relationship with the Muslim world. This intersection of Liberal realpolitik and Muslim diplomacy is where the Obama Administration meets its real foreign policy goals. As it uses the threat of Iran and its nuclear arsenal as leverage against Israel and on behalf of Fatah and Hamas terrorists. But the collection of brain damaged brats were too gleeful at taking the White House to control their real sentiments. And their open expression of hostility to Israel has been filed under the folder of, "Too much, too soon". That doesn't mean it's going anywhere, just that its grand entrance needs more work. The Obama Administration had spent too much time believing that its J Street affiliates represented American Jews. They belatedly discovered what Emanuel had probably already told them, that this wasn't the case. But Emanuel's outreach to a handful of liberal Rabbis shows the political limitations of his own echo chamber. If Peter Beinart is at least willing to menace liberals with the specter of a conservative Orthodox monopoly on Zionism, the Obama Administration doesn't even speak that language. Its understanding of the Jewish community is as narrow as its knowledge of American Christianity, with encyclopedic familiarity of its liberal allies, and ignorance and contempt of the conservatives in the shadows. In line with the left, the Obama Administration has adopted a Muslim-centric view of the Middle East conflict. But much of the Jewish community may have made concessions to that view, but has never adopted it. Yet this Nakba defined concept of Israel is uppermost not only for the Beinarts and the J Streets, but is the beating heart of Obama's Cairo speech. And when the Obama Administration tries to speak to pro-Israel audiences, it cannot even do so nearly as well as Clinton or Kerry, because it does not share a common language with them anymore. Where they celebrate Israel's independence, it mourns a tragic Muslim defeat. Where they appreciate a great country, it believes that Israel was a mistake. The gap in these two versions of history is as unbridgeable and profound as a Unionist talking to an IRA member. Obama shares no common history with Americans, and his Jewish associates do not share one with the Jewish people. And thus they think the problem is the messaging, when in reality it's their message. And their message has been received. Yes and this will continue until they have almost destroyed Israel. It is that man's goal. "Obama shares no common history with Americans, and his Jewish associates do not share one with the Jewish people. And thus they think the problem is the messaging, when in reality it's their message. And their message has been received." Yep. Received loud and clear. Indeed, he has no common history with Americans. He's always give off an air of not being one of us. As for his Jewish associates I don't think Obama can rely on them indefinitely. Eventually, they'll wake up. Hopefully sooner than later. I believe Rahm is getting some serious questioning by (at least) one of those "moderate liberal" rabbis. I truly wish this rabbi will see through the smoke and mirrors and realize he has backed a severely anti-Semitical and anti-Israel force. If he does, he will lose Rahm & his family from the congregation. I don't think that's really a loss, however. Very sad, how hard some people work to remain deluded. And its going to get people killed. Re: your statement, in quotes here, I take liberty & insert my view: "the Obama Administration doesn't even speak that language. (he doesn't speak it, NOT due to ignorance, but because not speaking it is integral to DESTROYING it's very essence) It (portrays itself as having an) understanding of the Jewish community is as narrow as its (portrayed) knowledge of American Christianity, with encyclopedic (propagandized) familiarity of its own liberal allies, and (Not in ignorance, but in pure) contempt of the conservatives in the shadows." To ascribe any ignorance to Obamas' communication is overly generous, and ultimately dangerous. He knows very well that truly Jewish and Scripture-educated believing Christians can be nothing other than FULLY in support of G-d's design for Israel. For HE said in Scripture "I will honor My Word above My Name". He did not say "except when it is politically inconvenient". True Christians will continue to support Israel at all cost. Re: your statement, in quotes here, I take liberty & insert my view: "the Obama Administration doesn't even speak that language. (he doesn't speak it, NOT due to ignorance, but because not speaking it is integral to DESTROYING it's very essence) It (portrays itself as having an) understanding of the Jewish community as narrow as its' (portrayed) knowledge of American Christianity, with encyclopedic (propagandized) familiarity of its own liberal allies, and (Not in ignorance, but in pure) contempt of the conservatives in the shadows." To ascribe any ignorance to Obamas' communication is overly generous, and ultimately dangerous. He knows very well that truly Jewish and Scripture-educated believing Christians can be nothing other than FULLY in support of G-d's design for Israel. For HE said in Scripture "I will honor My Word above My Name". One of the problems with J Street is that they were willing to talk to Obama as if they represented a broad Jewish view. This action divided the Jewish representation in America. Also, you may want to look at the way he is dealing with Iran. For Obama, it's more important to reach understanding with other powers then to solve the problem. That is, for Obama, his image comes first.